Fifty-three years ago, on this day the 2nd September in 1960, the Tibetan democratic system formally came into existence with the first directly elected representatives taking oath of office in accordance with the advice and wishes of Tibetan people’s supreme leader His Holiness the Dalai Lama, who believed that Tibet should follow the democratic system which was congruent with the general trend of the modern world. It is also more than two years since His Holiness the Dalai Lama devolved all the political and administrative authority to the people’s elected leaders. During this period, constant endeavour was made and continues to be so primarily to advance the Tibetan people’s struggle for truth and improve the efficiency of the main as well as the branch offices of the Central Tibetan Administration. These are a sign clearly indicating that the Central Tibetan Administration will be able to sustain firmly with progress and development until the issue of Tibet remains unresolved. However, all the Tibetan people must, as per the wishes of His Holiness the Dalai Lama, strive ceaselessly to improve the efficiency and progress of this fully democratic Administration. More than 54 years have elapsed since the whole of Tibet was forcibly occupied by Communist China. During these years China has used various devious and coercive methods to completely destroy the Tibetan identity, religion, culture, language, custom, etc with the evil design of transforming Tibet into a Chinese land. Tibetan people are oppressed and discriminated. Tibet’s environment is being destroyed in every respect. Moreover, the Chinese government has carried out repressive measures against the Tibetan people, who with unwavering loyalty to His Holiness the Dalai Lama and adhering firmly to the unchanging Tibetan national spirit have opposed the Chinese government by expressing their resentment to the above policies. Through various campaigns against the authorities. Due to these repressive policies, so far, 120 Tibetan men and women have self-immolated themselves as a peaceful protest from 2009 till date, thus giving rise to the urgent situation. However, the Chinese government has not shown any understanding of its responsibility of probing into the demands and aspirations of the self-immolators. In addition, the Chinese government has humiliated the self-immolators; falsely implicated His Holiness the Dalai Lama and the Central Tibetan Administration for instigating them; attempted to conceal incidents of self-immolation from leaking out; imposed severe restriction in towns and monasteries which are the main sites of self-immolation; innocent relatives are accused, arrested and imprisoned; and are accused of murder for which some are even given death sentences. Such mistreatment and torture continues to be perpetrated. Therefore, contrary to respecting and maintaining the human rights of the Tibetan people, the Chinese government continues to carry out actions, totally disregarding all the appeals made by nations, leaders and organizations who value democracy, freedom, truth and justice. Recently, Mr. Yu Zhengsheng, Chairman of National Political Consultative Committee and Member of Standing Committee of Political Bureau of the Government of the People’s Republic of China visited Tibet for inspection. At the time he said that the Dalai Lama’s demand for ‘Greater Tibet’ and ‘high degree of autonomy’ contravenes China’s constitution and regional national autonomy law, adding further that such demands breach the basic interest of Tibetan Buddhism. His Holiness the Dalai Lama and the Central Tibetan Administration have strifed for genuine autonomy for all Tibetans as per the provisions contained in the PRC constitution and autonomy law, which clearly spell out the right to regional ethnic autonomy. To say that this breaches the constitution clearly exposes the insincerity, hypocrisy and true face of Chinese communist autocrats who are illegally destroying Tibetan race, religion and culture. No prove is given which would suggest the breach of the PRC constitution. 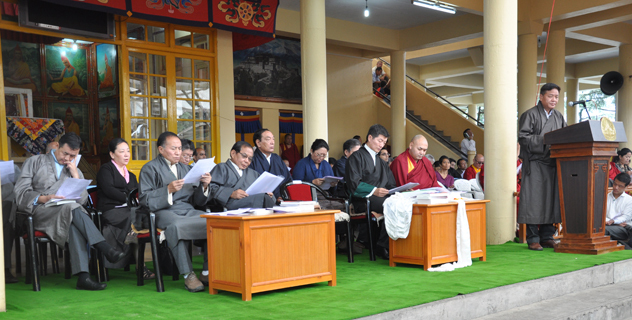 The Central Tibetan Administration has repeatedly explained to the Chinese government the essence of the mutually beneficial Middle Way Policy, which is based upon the coexistence of the two communities within the framework of PRC constitution and the entitlement of equal rights and prerogatives to the Tibetan people as is enjoyed by the other national minorities. However, the Chinese leaders have not only interpreted this incorrectly as breaching the constitution, the Tibetan people’s aspiration is intentionally misinterpreted as secessionist. This kind of publicity is a total disregard to all and opposed to the truth; a misrepresentation of reality and a shameless version of astonishing proportions. Under the so-called policy of helping Tibetan monks, nuns and monasteries, the Chinese government has been forcing the monasteries to fly the Chinese National flag, display portraits of Chinese leaders and purposely carries out activities such as the resented ‘patriotic education’, purposely setting up of radio and television connections, in the monasteries for which are a source of disturbance to religious studies and meditation. For example, a total number of 6575 Chinese cadres have been stationed in 1787 monasteries in the so-called Tibet Autonomous Region alone. These cadres are used for the political objectives of the Chinese government. Such acts must be stopped and reforms must be carried out. Since 1 July this year, an exhibition distorting the history of former resident Amban or Chinese Representative in Tibet has been on display, thus spreading lies to the domestic and international tourists and visitors. Likewise, the so-called ‘genuine background drama Wenchen-Kunjo has been performed in Lhasa beginning 1st August of this year for which the Chinese government has invested millions of dollars. This is a performance aimed at political necessity to indoctrinate and distort history. Therefore, people of the world including Tibetans and Chinese must be careful not to fall a prey to such deceit and enticement. Safeguarding the ecology of Tibet is not only in the interest of Tibet and China, it is also linked to the lives of several hundred million sentient beings spread across the eastern and northern parts of the world. It has become a subject of major interest by global environmentalists and meteorologists. But, the Chinese government, on one hand, continues calling for building Tibet and strengthening of environment protection along with long-time stability, development and aid to challenge the opponents. On the other hand, every possible measure is taken to remove Tibetan nomads in order to facilitate the extraction of Tibet’s natural resources which is transforming the very appearance of the land. Implementing the so-called ‘Three-Red- Lines’ strategy as a principle for the extraction of minerals everywhere, the Chinese government has set up mines in all parts of Tibet to extract valuable minerals such as gold, silver, copper, iron and many other minerals. Huge amounts of Tibet’s mineral products and natural resources are transported to China. To fulfill the need of population transfer, the so-called Tibet -Tsongon railway is being expanded and new direct railway tracks are being laid from the railway station of NaGormo to many cities of China. Another project expanding the railway line from Lhasa to other parts of Tibet has been started. Similarly, under the pretext of modernization and development, numerous dams have been built and continue to be constructed in all parts of Tibet. Consequences of these will befall the globe in general, specially South-East Asia, and particularly severe damage will be caused to Tibet’s ecology and protection of Tibetan identity. It is therefore important for everyone to pay due attention to these activities. Moreover, local Tibetan people of Tsongon, Yulshul and Zatoe counties have been living under critical situation since 12th August, 2013 following severe incidents of suppression unleashed on them in response to their lawful protests against the planned mining of white diamonds. As such, we firmly appeal to the Chinese government to respect the dignity and aspirations of the Tibetan people by immediately putting an end to repression and mining. This year severe restriction was imposed in the Tibetan areas of Tawu, Kardze, Lithang, Drakgo, Golok Tawo, Labrang, Machu, Chabcha, Kumbum monastery, etc during the celebration of the 78th birthday of His Holiness the Dalai Lama. Particularly, when the monks and nuns of Nyatso and Gaden Choeling in Tawu together with Tibetan people of the locality were performing the incense offering ceremony on top of Machen Pomra Mountain as part of the birthday celebrations, four Chinese police vans and seven military trucks arrived at the site. Without listening to the explanation given by the Tibetan people, the Chinese police began beating and shots were fired against the gathering. Similarly, Lama Dawa Rinpoche of Gaden Dargyeling monastery in Nagchu Shagrongpo was accused of maintaining communication with His Holiness the Dalai Lama over the reincarnation of Rongpo Choeje. The monastery was suppressed leading to the detention of monk officials, closure of the monastery, suicide of a monk, etc. These incidents clearly prove that the Chinese policy of religious freedom is a mere empty word. The unbearable critical situation and problems faced by Tibetans inside Tibet, literally making days and nights extremely difficult to pass is caused, firstly, by the lack of democratic system in Tibet and China till date, and secondly, by the few hardline Chinese leaders. For Tibetans living in foreign countries, including India, it is a matter of great joy that they are able to enjoy a high degree of genuine democracy. Still, we need to tread forward in order to progress higher and higher. It may be pointed out that preparations be made in earnest to present this excellent system of democracy as a gift when Tibetans inside and outside are reunited after a solution to the Tibetan problem is found. More than fifty-four years have passed since we sought refuge in India and other foreign countries. Especially, India has become like a second home for us. We are profoundly grateful for the extensive aid and protection provided by the people and government of India. Remembering and cherishing forever the kindness and seizing the opportunity provided by this auspicious occasion, we would like to express our heartfelt gratitude to both the people and government of India, and to the global leaders, nations, Tibet Support Groups as well as individuals who have been steadfastly supporting Tibet. Pursuant to the profound advise continuously given by Tibet’s leader His Holiness the Dalai Lama, we are appealing to all the Tibetan people in exile to develop and maintain strong friendly relations with the people of host nations, thereby contributing to the Tibetan people’s reputation, dignity and security. In conclusion, we sincerely pray that His Holiness the Dalai Lama live for as long as hundreds of aeons; may all His sacred wishes be fulfilled with spontaneity; and may the just cause of Tibet sees its fruition as swiftly as possible.